For the recently-concluded season, see The Amazing Race Canada 6. The Amazing Race Canada (Canadian French: The Amazing Race Canada: Une Course Contre la Montre  ) is a reality television competition series that features teams in a grueling race across Canada and the world. The Race is divided into a series of legs; on each leg teams strive to reach the Pit Stop where they are greeted by the host, Jon Montgomery. During each leg teams receive destination clues and challenges to complete in order to move onto the next task. The first team to cross the finish line wins a combined total of $500,000 in both cash and prizes. This prize is the largest grand prize ever awarded for a Canadian competition series. Commissioned by CTV, The Amazing Race Canada is produced by Insight Productions in association with Bell Media and with the support of Profiles Television. Canadian French is the French language spoken in Canada. It includes the the varieties of French used in Canada such as Quebec French. 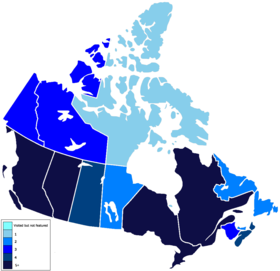 Formerly Canadian French referred solely to Quebec French and the closely related varieties of Ontario (Franco-Ontarian) and Western Canada—in contrast with Acadian French, which is spoken in some areas of eastern Quebec, New Brunswick, and some areas of Nova Scotia. PEI and Newfoundland & Labrador have Newfoundland French. Jonathan Riley "Jon" Montgomery is a Canadian skeleton racer and television host. He won the gold medal in the men's skeleton event at the 2010 Winter Olympics in Vancouver, British Columbia. The Canadian passport is the passport issued to citizens of Canada. It enables the bearer to exit and re-enter Canada freely; travel to and from other countries in accordance with visa requirements; facilitates the process of securing assistance from Canadian consular officials abroad, if necessary; and requests protection for the bearer while abroad. The Amazing Race Canada is a reality television competition between at least nine teams of two. The race is divided into a number of legs wherein teams travel and complete various tasks to obtain clues to help them progress to a Pit Stop, where they are given a chance to rest and recover before starting the next leg twelve hours later. The first team to arrive at a Pit Stop is often awarded a prize while the last team is normally eliminated from the race (except in non-elimination legs). The final leg of each race is run by the last three remaining teams, and the first to arrive at the final destination wins CA$250,000, two vehicles of any Chevrolet model cars and unlimited air travel for a year with Air Canada. In the second season, Petro-Canada and Scotiabank were added as sponsors, with the team winning a lifetime supply of gasoline from Petro-Canada. In the third season, the Bank of Montreal (BMO) replaced Scotiabank as the financial sponsor. In the fourth season, Hotels.com replaced Air Canada as the trip sponsor. Petro-Canada is a retail and wholesale marketing brand of Suncor Energy. Until 1990, it was a crown corporation of Canada, headquartered at the Petro-Canada Centre in Calgary, Alberta. In August 2009, Petro-Canada merged with Suncor Energy, with Suncor shareholders receiving approximately 60 percent ownership of the combined company and Petro-Canada shareholders receiving approximately 40 percent. The company retained the Suncor Energy name for the merged corporation and its upstream operations. It continues to use the Petro-Canada brand nationwide, except in Newfoundland and Labrador, for downstream retail operations. The Bank of Nova Scotia, operating as Scotiabank, is a Canadian multinational bank. It is the third largest bank in Canada by deposits and market capitalization. It serves more than 25 million customers around the world and offers a range of products and services including personal and commercial banking, wealth management, corporate and investment banking. With a team of more than 88,000 employees and assets of $998 billion, Scotiabank trades on the Toronto and New York Exchanges. The Bank of Montreal, (French: Banque de Montréal) doing business as BMO Financial Group, is a Canadian multinational investment bank and financial services company headquartered in Toronto, Ontario, Canada. One of the Big Five banks in Canada, it is the fourth-largest bank in Canada by market capitalization and assets, as well as one of the ten largest banks in North America. It is commonly known by its acronym BMO, which is also its stock symbol on both the Toronto Stock Exchange and the New York Stock Exchange. Each team is composed of two individuals who have some type of relationship to each other. A total of 62 teams, or 124 contestants, have participated in The Amazing Race Canada. Route Markers are yellow and red flags that mark the places where teams must go. Most Route Markers are attached to the boxes that contain clue envelopes, but some may mark places where teams must go in order to complete tasks, or may be used to line a course that the teams must follow. Clues are found throughout the race in sealed envelopes, normally inside clue boxes. They give teams the information they need and tasks they need to do in order for them to progress through the race. Detour: A choice of two tasks. Teams are free to choose either task or swap tasks if they find one option too difficult. Roadblock: A task only one team member can complete. Teams must choose which member will challenge the task based on a brief clue about the task before fully revealing the details of the task. Fast Forward: A task that only one team may complete, allowing that team to skip all remaining tasks and head directly for the next Pit Stop. Teams may only claim one Fast Forward during the entire race. Canada 150 Challenge: A series of special challenges during season 5 to commemorate the 150th anniversary of the Confederation of Canada. They had no effect on the gameplay mechanics of the "Race"
The fifth season of The Amazing Race Canada is a reality game show based on the American series The Amazing Race. It features teams of two, each with a pre-existing relationship. The grand prize includes: a CA$250,000 cash payout, a "once-in-a-lifetime" trip for two around the world, and a 2018 Chevrolet Equinox "True North Edition" for each. For the fifth year in a row, Jon Montgomery returned as the host. U-Turn: An obstacle where a team can force another trailing team to complete the other option of the Detour they did not select. Teams may use their ability to u-turn another team more than once throughout the race (as opposed to the American version, which allows only one), as shown in Season 3 when Gino & Jesse u-turned two teams. Face Off : An obstacle which has two teams compete against each other in a specific task. The winning team is given the next clue, while the losing team must wait out a 15-minute penalty before receiving the next clue. The third season of The Amazing Race Canada is a reality game show based on the American series The Amazing Race. It features twelve teams of two, each with a pre-existing relationship. The grand prize includes: a CA$250,000 cash payout, “gas for life” from Petro-Canada, the opportunity to fly for a year anywhere Air Canada flies worldwide in Business Class, and two Chevrolet Colorado "Z71" Trucks. For the third year in a row, Jon Montgomery returned as the host. At the beginning of each leg, teams receive an allowance of cash, usually in Canadian dollars, to cover expenses during the race (except for the purchase of airline tickets, which are paid-for by credit cards provided to the teams). Teams then have to follow clues and Route Markers that will lead them to the various destinations and tasks they will face. Modes of travel between these destinations include commercial and chartered airplanes (which for the first three seasons were generally provided by sponsor Air Canada), boats, trains, taxis, buses, and rented vehicles provided by the show, or the teams may simply travel by foot. Each leg ends with a twelve-hour Pit Stop where teams are able to rest and where teams that arrives last are progressively eliminated from the race until only three teams remain. Most legs comprise three or more challenges, often a Roadblock, Detour and a Route Info Task. The first teams to arrive at the Pit Stop win prizes, usually from the show's sponsors. The Express Pass , awarded to the winners of the first legs of seasons 1 and 2, allows that team to skip any task they want during the race. In Season 1, Kristen & Darren won this pass, one for themselves and gave the second one to Vanessa & Celina; Kristen & Darren ultimately did not use theirs. Vanessa & Celina used their Express Pass to bypass the Detour in Leg 4. In Season 2, Natalie & Meaghan won this pass, one for themselves and gave the second one to Pierre & Michel; Natalie & Meaghan used their Express Pass to bypass the Detour in Leg 3. Pierre & Michel used their Express Pass to bypass the Roadblock in Leg 6. In seasons 3 and 4, the Express Pass was given out in an optional task in Leg 2 right before the Detour, allowing any team to possibly win it rather than it being a definite award for a first-place finish on the leg. In Season 3, Hamilton & Michaelia won this pass, one for themselves and gave the second one to Brent & Sean; Hamilton & Michaelia immediately used their Express Pass to bypass the Detour in Leg 2. Brent & Sean used their Express Pass to bypass a task in Leg 7. In Season 4, Steph & Kristen won this pass, one for themselves and gave the second one to Frankie & Amy; Steph & Kristen ultimately did not use theirs. Frankie & Amy used their Express Pass to bypass the Roadblock in Leg 6. In Season 5, three separate Express Passes were available to be found in Leg 2 during the Roadblock, allowing any three teams to possibly win one; or a team could win more than one Express Pass, but they must give the other(s) away by the end of the third leg. Kenneth & Ryan found all three passes, they gave one to Karen & Bert as a reward for help in a task later in Leg 2, and gave the other to Megan & Courtney early in Leg 3. Kenneth & Ryan used their Express Pass to bypass the Detour in Leg 3; Karen & Bert used their Express Pass to bypass a task in Leg 3; Megan & Courtney ultimately did not use theirs. In Season 6 (Heroes Edition), three separate Express Passes were available to be found during a task in Leg 2, allowing any three teams to possibly win one. Nancy & Melissa, Todd & Anna, and Leanne & Mar each won one. Todd & Anna and Leanne & Mar used their Express Passes to bypass the same task in Leg 3; Nancy & Melissa used their Express Pass to bypass a later task in Leg 3. Each race has a number of predetermined non-elimination legs, in which the last team to arrive at the Pit Stop is not eliminated and is allowed to continue on the race. The non-eliminated team is required to do a Speed Bump sometime during the next leg. Speed Bump: A task that only the team saved from elimination on the previous leg must complete before continuing on. Most of the rules and penalties are adopted from the American edition. The show first aired in 2013 with the first season premiere airing on July 15, 2013 and ending on September 16, 2013. July 15, 2013 September 16, 2013 Tim Hague, Sr. & Tim Hague, Jr. 9 Only travelled across Canada. July 8, 2014 September 21, 2014 Mickey Henry & Pete Schmalz 11 First season to feature international travel. July 8, 2015 September 23, 2015 Gino Montani & Jesse Montani 12 Introduced the Face Off. July 4, 2017 September 12, 2017 Sam Lambert & Paul Mitskopoulos Canada 150-themed challenges. Provinces and territories visited in The Amazing Race Canada as of Season 6. Countries visited in The Amazing Race Canada as of Season 6. The following are the number of times places (including Canadian provinces and territories) are featured in The Amazing Race Canada. ^ This count only includes provinces that fielded actual route markers, tasks/challenges or pit stop/finish mats. Transport stopovers and connecting flights are not counted or listed. ^ Including the Special Administrative Regions of Hong Kong (2) and Macau (2). The Amazing Race 16 is the sixteenth installment of the American reality television show The Amazing Race. This season featured eleven two-person teams, each with a pre-existing relationship, in a race around the world. The Amazing Race 18 is the eighteenth installment of the reality television show The Amazing Race. The Amazing Race 18 featured eleven teams of two – each returning from a previous edition for the first time since Season 11 – in a race around the world for a $1 million prize. The Amazing Race 19 is the nineteenth installment of the American reality television show The Amazing Race. This season featured 11 teams of two, with a pre-existing relationship, in a race around the world. The 19th season premiered on September 25, 2011. The Amazing Race China is a reality game show based on the American reality TV series, The Amazing Race. The Amazing Race 21 is the twenty-first installment of the American reality television show The Amazing Race on CBS. It featured eleven teams of two, each with a pre-existing relationship, in a race around the world. The Amazing Race 22 is the twenty-second installment of the reality television show The Amazing Race. It featured eleven teams of two, each with a pre-existing relationship, in a race around the world. The Amazing Race 23 is the twenty-third installment of the reality television show The Amazing Race. It featured eleven teams of two people, each with a pre-existing relationship, in a race around the world for a US$1 million grand prize. The first season of The Amazing Race Canada was a reality game show based on the American series The Amazing Race. It featured nine teams of two with pre-existing relationships who raced around Canada for CA$250,000, two Chevrolet Corvette Stingrays and an unlimited air travel for a year with Air Canada. The show was produced by Insight Productions, in association with Bell Media and was broadcast on CTV. The show was hosted by Canadian Olympian Jon Montgomery. The Amazing Race 24 is the twenty-fourth installment of the reality television show The Amazing Race that featured eleven teams of two – each returning from a previous edition for the first time since Season 18 – in a race around the world for a $1 million prize. The Amazing Race 25 is the twenty-fifth installment of the reality television show The Amazing Race. It featured eleven teams of two in a race around the world for a US$1 million grand prize. The second season of The Amazing Race Canada was a reality game show based on the American series The Amazing Race. It featured eleven teams of two, each with a pre-existing relationship in a race across Canada and around the world. The winning team was awarded CA$250,000, two Chevrolet Silverado "High Country Edition" trucks, free gasoline for life from Petro-Canada and the ability to fly for free anywhere for a year with Air Canada in business class. Jon Montgomery returned as the host. The Amazing Race 26 is the 26th installment of the reality television show The Amazing Race. In this installment, eleven teams of dating couples competed in a race around the world for a $1 million (USD) grand prize. The season premiered on CBS for the 2014–15 television season with a special 90-minute episode on Wednesday, February 25, 2015. Following the premiere, the program aired in the same time slot that the previous season of The Amazing Race took. The season finale aired on May 15, 2015. The Amazing Race 27 was the twenty-seventh installment of the U.S. reality television show The Amazing Race. It featured eleven teams of two, with each team centered on a pre-existing relationship between the cast members such as marriage, dating, or best friends. Teams competed in a race around the world for a US$1 million grand prize. The fourth season of The Amazing Race Canada is a reality game show based on the American series The Amazing Race. It features 10 teams of two, each with a pre-existing relationship. The grand prize includes: a CA$250,000 cash payout, a "once-in-a-lifetime" trip for two around the world with hotel accommodations provided by new sponsor Hotels.com, and the winning team's choice of any Chevrolet vehicle driven during the race. For the fourth year in a row, Jon Montgomery returned as the host. The Amazing Race 28 is the twenty-eighth U.S. season of the reality television show The Amazing Race. The season premiered on February 12, 2016. In this installment, it featured 11 teams of two with notable social media personalities in a race around the world for a $1 million grand prize. The sixth season of The Amazing Race Canada is a reality game show based on the American series The Amazing Race. It features ten teams of two consisting of everyday Canadian heroes. The grand prize includes: a CA$250,000 cash payout, a "once-in-a-lifetime" trip for two around the world, and a 2018 Chevrolet Traverse Redline for each. For the sixth year in a row, Jon Montgomery returned as the host. ↑ "The Amazing Race Canada: Une Course Contre la Montre". Vrak TV . Retrieved April 14, 2016. ↑ Chris Jancelewicz (September 17, 2013). "'Amazing Race Canada' Season 2: CTV Announces Second Run". Huffpost Canada TV. Retrieved September 25, 2013. ↑ "The Amazing Race Canada: Eligibility Requirements And Detailed Application Information". CTV.ca. ↑ "Season 6 Casting". CTV. October 27, 2017. Retrieved October 27, 2017. ↑ "Canada's Choice: Fan Votes Decide Which Team Gets the Ultimate Second Chance on Season 7 of THE AMAZING RACE CANADA, This Summer on CTV". Bell Media. March 21, 2019. Retrieved March 21, 2019. ↑ "Top Programs – Total Canada (English) July 15–21, 2013" (PDF). BBM Canada. July 26, 2013. Archived from the original (PDF) on September 3, 2013. Retrieved July 26, 2013. ↑ "Top Programs – Total Canada (English) September 16–22, 2013" (PDF). BBM Canada. September 27, 2013. Archived from the original (PDF) on September 28, 2013. Retrieved September 28, 2013. ↑ "TV Top 10: What Canadians Watched in 2013". newswire.ca. Retrieved August 8, 2016. ↑ "Top Programs – Total Canada (English) July 7–July 13, 2014" (PDF). Numeris. July 22, 2014. Archived from the original (PDF) on July 28, 2014. Retrieved July 23, 2014. ↑ "Top Programs – Total Canada (English) September 15–September 21, 2014" (PDF). Numeris. September 30, 2014. Retrieved October 1, 2014. ↑ "TV Top 10: What Canadians Watched in 2014". bellmedia.ca. Retrieved August 8, 2016. ↑ "Top Programs – Total Canada (English) September 21 - September 27, 2015" (PDF). Numeris. Retrieved October 7, 2015. ↑ "TV Top 10: What Canadians Watched in 2015". bellmedia.ca. Retrieved August 8, 2016. ↑ "Top Programs – Total Canada (English) June 27 - July 3, 2016" (PDF). Numeris. July 11, 2016. Retrieved July 11, 2016. ↑ "Top Programs – Total Canada (English) September 12 - September 18, 2016" (PDF). Numeris. September 27, 2016. Retrieved September 27, 2016. ↑ "Top Programs – Total Canada (English) July 3 - July 9, 2017" (PDF). Numeris. July 18, 2017. Retrieved July 18, 2017. ↑ "Top Programs – Total Canada (English) September 11 - September 17, 2017" (PDF). Numeris. September 26, 2017. Retrieved September 26, 2017. ↑ "Top Programs – Total Canada (English) July 2 - July 8, 2017" (PDF). Numeris. July 17, 2018. Retrieved July 17, 2018. ↑ "Top Programs – Total Canada (English) September 10 - September 16, 2018" (PDF). Numeris. September 25, 2018. Retrieved October 4, 2018. ↑ "Awards Database". academy.ca. Retrieved November 10, 2016. ↑ "2017 TV Nominees - Academy.ca". Academy.ca. Retrieved March 9, 2017.